There’s no doubt that releasing a platformer, specifically a 3D platformer, on a Nintendo system is a bit of a nerve-wracking thought. Competing against the likes of Mario and other classic franchises that have graced Nintendo systems over the years generally isn’t going to be pretty. 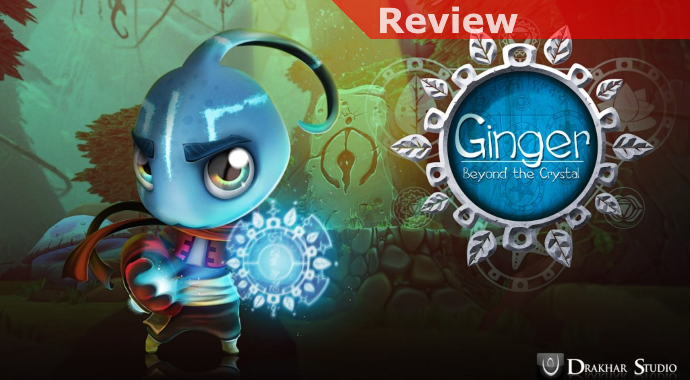 Ginger: Beyond the Crystal has sought to make a mark on the Switch but even without Mario Odyssey present it stumbles a bit in execution. Never quite sure whether it wants to be a hand-holding friendly-for-all-ages title or something a bit more challenging I could never quite figure out who it is targeting. Starting with the basics there’s some lore about the world you find yourself in and why you’re on your quest to restore the blue crystals. I appreciate the effort but honestly its attempts like these that make me reflect on the fact that perhaps Mario always trying to save the Princess from Bowser may be just fine even if predictable, it allows you to just get to the action. Once you get through the training wheel stage you’ll be off to the hub world of sorts and then on to the action. The way things work, I’ll admit, is a little odd. In the overworld itself you’ll generally work to try to restore the ruined places you encounter. You’ll do this with various supplies you can find around the world but also by completing small quests. 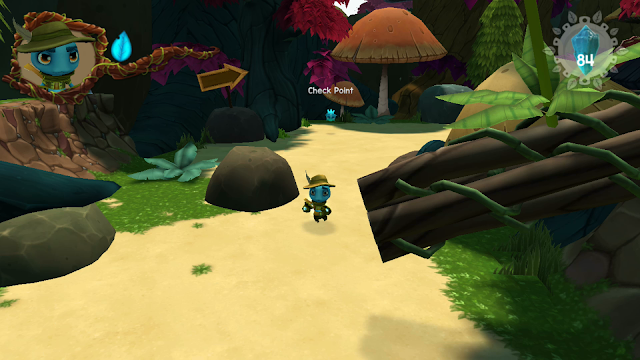 These are generally pretty basic and involve retrieving items or defeating a few bad guys. As combat is extremely basic (you’ll either combo punch, dash punch, or do a strangely slow jump attack punch) this isn’t often challenging. By restoring buildings you’ll make progress in making everyone happy and if you build specific variations of the dwellings you’ll unlock little customized appearance pieces in the shop. Getting to the business of action you’ll unlock opportunities to go into portals that will give you a somewhat 2.5D action platforming level to complete. Within these levels there will be a mix of enemies, traps, timed challenges, and some simple problems to solve. Exploration is pretty limited, though there are sometimes opportunities to find some hidden supplies behind objects or on top of things if you keep an eye out. There will also often be elements tied to a specific suit you’ll need to find in the game, like a mouse suit that will make you shrink or a lizard suit that will let you work with fire. This helps to encourage you to return to the levels later and tries to keep things a bit more interesting but aside from these sorts of obstacles strewn about the suits don’t have a further role to play. 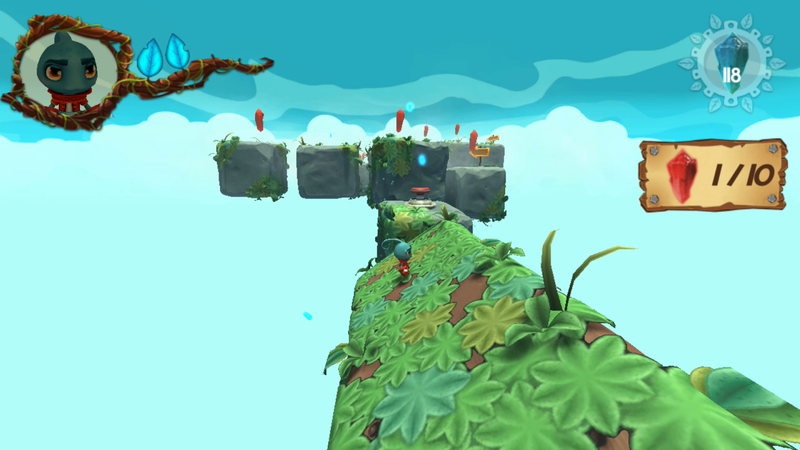 Once you complete these 2.5D platforming levels a red crystal will appear for you to jump in and then you’ll work to complete a more complex 3D platforming level with rotating platforms and other trappings as well. While you can see the ideas that the game is shooting for it’s in the execution that things can get sketchy. One moment it feels like the game is guiding you by hand and the next you’ll hit things like minecarts or other contraptions that are unusually tricky to get moving during a timed challenge. While there’s an overworld with various things to do it all feels pretty thin and underdeveloped on the whole, making me wish more time had just been into making the platforming action a bit more compelling. In the 3D levels I also had a few cases where I clipped through the platforms and died, which was also a bit disappointing. None of this utterly cripples the game, it just makes a bit harder to appreciate fully. Ginger: Beyond the Crystal isn’t necessarily a bad game, it just struggles to work very well in most areas. In general it is all light-hearted and fun, it just feels like it needed a bit more time and expertise to help fully realize its potential. If you come in understanding its shortcomings it should be a reasonably enjoyable experience though.